We’ve all been there at one time or another. It’s the time when you’re exhausted but your child is wide awake. Wide-Awake Bear is Elliot’s story. Elliott, a little bear, and his mother prepare to nap until spring arrives. Elliot dreams of spring until something awakens him, and he can’t go back to sleep. He tries everything, but the shadows and dark shapes in the cave scare him. His mother wakes and comforts him, but he is still a Wide. Awake. Bear. He pretends he’s a little fish and swims to the den’s opening. When he sees snow, ice, and dark clouds, he’s disappointed spring isn’t anywhere to be found. Mama assures him spring will come and tells him many things need to sleep during the winter. With his mother’s help, they fix Elliot’s bed, share a treat, and snuggle until there is no more wide-awake bear. Author, Pat Zietlow Miller does a splendid job of creating a sweet tale about going to sleep. Parents and children will easily relate to this story when it comes to family bedtime. Jean Kim’s illustrations done in soft colors will steal your heart. This book begs to read again. Spring is off on a junket to Las Vegas, gambling on “weather” it will come back or leave winter in its place. My odds are on winter. In the last two weeks, we’ve had rain, wind, sleet, cloud cover, frost, temperatures below normal, and only an occasional appearance of the sun. Okay, there was one teaser day in among all the rest. It came suddenly out of the ugly, grey skies. Heat and humidity embraced the day, convincing us that spring was here at last, but within twenty-four hours the icy fingers of winter were holding us hostage again. The birds were skating on ice in the birdbath, and the buds on the trees and bushes were bundled up tight, refusing to reveal their splendor. 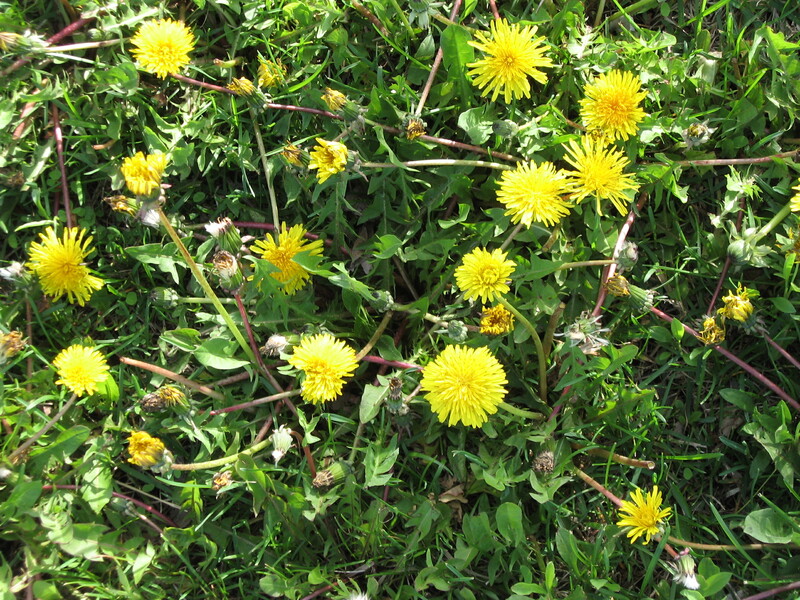 There is only one sure sign that that spring is here – dandelions. They’re outside, dancing in the wind and having a grand old time. I refuse to let the cold get me down. I’m putting on my hat, scarf, mittens, and coat. With tools in hand, I’m going outside to hunt for spring and wipe the smile off those dandelion faces!